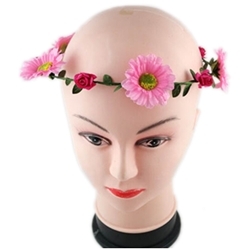 Includes one headband with multi-color flowers running around it. The multi-color flower hippie headband has the look of green leaves and brightly colored flowers. Flower colors come assorted and may be different from pictured colors. This headband would be perfect for almost any hippie themed costume.